When sixteen year old Tessa Gray arrives in England during the reign of Queen Victoria, something terrifying is waiting for her in London’s Downworld, where vampires, warlocks, and other supernatural folk stalk the gaslit streets. Friendless and hunted, Tessa seeks refuge with the Shadowhunters, a band of warriors dedicated to ridding the world of demons. Drawn ever deeper into their world, she finds herself fascinated – and torn between – two best friends and quickly realises that love may be the most dangerous magic of all. My first review for 2011 and yet I read this book last week, being 2010, but I won’t be including it in any reading challenges. I was going to wait till this year to read it as part of my Off The Shelf and maybe my Steampunk one, but Clockwork Angel isn’t really Steampunk in my view. Maybe to some because of the gadgets and robots used in it, but to me if a book is set in Victoriana times then it is not Steampunk. 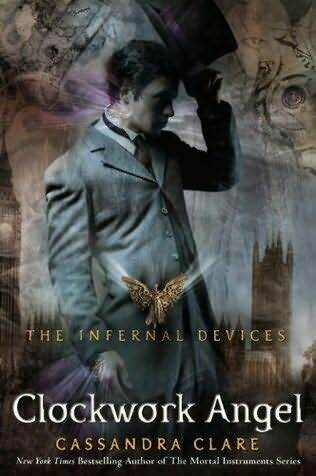 Now I have that out of the way, I really enjoyed Clockwork Angel by Cassandra Clare, the first in her Infernal Devices trilogy. It’s the prequel to her Mortal Instruments series, but I think you can get away with reading it without reading MI first. There is one character that is in the MI series, but it’s not pertinent to know about him beforehand. It feels more like a nice extension of the world, and also like a bit of a crossover character wise. I’ve noticed that some synopses differ in that it leads you to think it’s either a love story with a love triangle compared to it being more about this mystery with a bit of romance. I hate love triangles (refer to my 3in1 review that mentions love triangles, but please be aware there are spoilers for VA fans) and am not overly thrilled when it comes to reading romance stories, so for those who might be deterred by the love triangle synopsis; I urge you to discard it because yes there is a romantic quality, but being the first book in the trilogy and therefore an introduction to the characters, the romance aspect of it is light. Overall the characters are fun, intriguing, and crack me up. You have one that is so arrogant and one that is almost his polar opposite, but I still love both of them. They counteract, and compliment each other, plus add an interesting dynamic to the story. And Will (the arrogant one) is hilarious on his own, but I don’t think he would be as engaging and hilarious if he wasn’t able to banter with the other characters. This is one example I can think of where the humour is enhanced because the characters work so well together, not just the two boys Jem and Will, but all of them work really well together. It just happens my example is between the two boys. I love it because they go on these little tangents or digress, but never really leave the story behind. It all works so well together, the banter, the descriptions, the plot, the way the world and idea is executed, the use of language that fits with the times and the sensibilities that both fit with the time and clash with the Shadowhunter world. I find it to be really well written, forming a cohesive whole, and Clare’s writing style is so that the images formed in your head stay with you afterwards. I also really like how the title is taken from something in the story, but the story isn’t dominated by that something. I appreciate a title that works in with the story, but is more subtle. Especially when it is in a trilogy like this because it opens up the door to even more intrigue compared to what there already was. Now I just have to wait for the next one which I am greatly anticipating, not just because of the ending, but because there’s so much in there that has been left unanswered and is really enough to pique one’s interest. Demographic: YA, but enjoyable for adults too. The story is still up at my blog, I just posted part 5 (of 6) today in fact. Like I said, not as much of the ‘Steampunk’ (by which I mean mostly the gadgets and sense of wonder with technology) really shows through in this one, so please don’t judge it too harshly! 😀 I’m writing a follow up story that deals more directly with some of those elements. Thanks for the review. I’d seen this on a bookshelf and considered giving it a try. Like Marg, I was interested in your ‘not steampunk’ categorization of the work. I guess that what comes from a relatively new, and ill-defined, genre? I’m posting a serialized short story that I’ve loosely labeled as Steampunk on my blog, though much of that doesn’t come through in this particular story. It ended up being more ‘Victoriana/Fantasy/Horror’. There will be more stories that will go into greater detail on the Steampunk elements, I hope. I’ve been a fan of Steampunk for years. Although it’s more of an interest in the fashion, the culture, and the gadgets, I still have an appreciation of art, movies, and novels inspired by it. I have a bit of trouble with accepting stories set in Victoriana times as Steampunk, seeing as Steampunk is meant to be if Victorian sensibilities and other aspects of that time lived on. So even though there’s stories set in the Victorian period with awesome gadgets, I don’t buy it or accept it as Steampunk. It’s like when people say that The Time Machine is Steampunk when it’s not and Steampunk didn’t come around till much later. Anyway, that’s my argument for it and I hope it help clears up any confusion. I’d love to come check out your story too, if it is still there. I can’t wait for the next book set in this world! I liked the first trilogy a lot, and am looking forward to CoFA, but I will be more pleased by this one. I was interested in your comments about this not being steampunk. I would have considered it to be fantasy with steampunk elements given the robots etc. I guess yeah it’s fantasy with Steampunk elements, but I usually don’t like considering something in Victorian times as Steampunk even if it does have robots. I guess maybe I’ve been more influenced by futuristic Steampunk and maybe some cyberpunk. I also haven’t actually read that much Steampunk, I’m more into the culture, fashion, and gadgets. Maybe I just expect Steampunk lit to be more futuristic, but I still loved it and the gadgets and all the other elements to it. Same here with the next one. I think I’m looking forward to the sequel more than CoFA, especially because of the characters and the Victoriana.